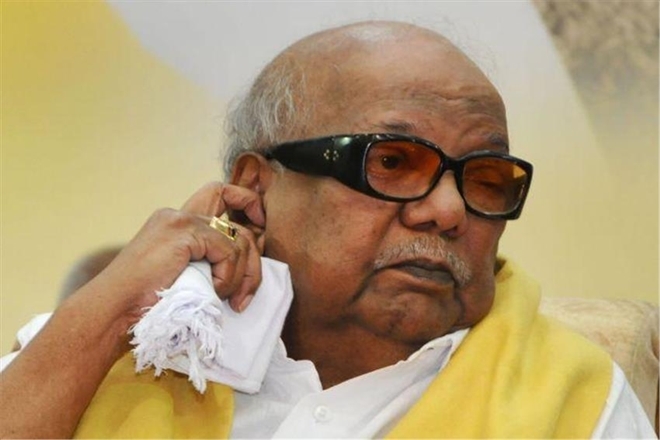 DMK Chief and former Chief Minister of Tamil Nadu M. Karunanidhi succumbed to his illness at Kauvery hospital in Chennai on Tuesday at 06:10 in the evening. The 94 year old politician was admitted to the hospital on 28 July, 2018 due to bad health conditions. Since then his health status showed many ups and downs. The main reason behind his deteriorating health conditions was age, doctors claimed. DMK working president MK Stalin met chief minister Palaniswami, discussing the issue of burial of Karunanidhi at Marina Beach. However, controversy stirred over the allocation of the last resting place of the DMK patriarch after the Tamil Nadu government rejected permission to bury M Karunanidhi at the iconic Marina Beach in Chennai. DMK General Secretary issued a statement: Karunanidhi's mortal remains to be taken to his Gopalapuram residence. Family members and relatives can pay their respects between 8.30 p.m and 1 a.m. Following this, Karunanidhi's mortal remains will be kept at his CIT Colony residence between 1 a.m. and 3 a.m. At 4 am, his remains will be taken to Rajaji Hall where party cadre, general public and political leaders can pay their respects. Tamil Nadu government declares August 8 to be a public holiday in honour of DMK chief M Karunanidhi. The state government has also announced a 7-day mourning period announced. PM Narendra Modi to visit Chennai on Wednesday. Entered politics at the age of 14 and participated in Anti-Hindu movement and then founded an organization for local youth. He has 3 sons and 2 daughters- M.K. Alagiri (Politician), M.K. Stalin (Politician), M.K. Tamilarasu (Film Producer), Selvi, Kanimozhi (Rajya Sabha MP). 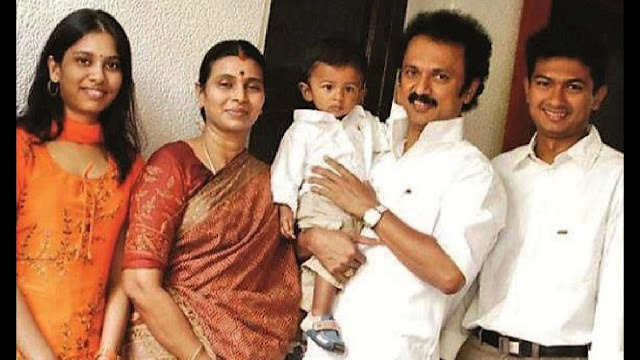 His son MK Stalin and daughter Kanimozhi were accused in the 2G scam in the year 2010. Sarkaria Commission accused him of his involvement in corruption in the allotment of tenders for Veeranam project. In 2001 he along with former chief secretary K.A. Nambiar was arrested on charges of corruption in construction of a flyover in Chennai. No rigid evidence was found against them. In 2012, while celebrating the foundation day of the party, he was received by a group of people who were dressed portraying some Hindu Gods stirring controversy. Made controversial remark against 'Sethusamudram' - the bridge built by Lord Rama connecting India and Srilanka, again making controversy and questioned the existence of God and asked the college from where Lord Rama graduated in engineering for building the Ramar Setu bridge. Accused of having links with Sri lankan militant group LLTE for creation of independent State for Tamil speaking Sri Lankans and also in encouraging them to assassinate Rajeev Gandhi. Accused of promoting nepotism for helping his son and daughter to rise in party and politics. He was awarded "Raja Rajan Award" by Tamil University, Thanjavur for his book Thenpandi Singam. 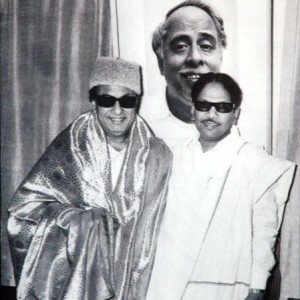 In June 2007 the Tamil Nadu Muslim Makkal Katchi announced that it would confer the title "Friend of the Muslim Community" (Yaaran-E-Millath) upon M. Karunanidhi. 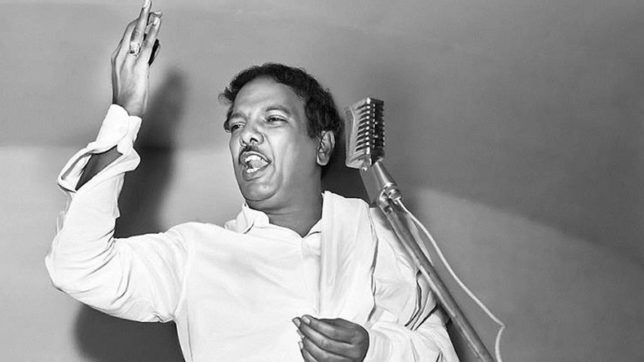 Karunanidhi is known for his contributions to Tamil literature. His contributions cover a wide range: poems, letters, screenplays, novels, biographies, historical novels, stage-plays, dialogues and movie songs. He has written Kuraloviam for Thirukural, Tholkaappiya Poonga, Poombukar, as well as many poems, essays and books. Apart from literature, Karunanidhi has also contributed to the Tamil language through art and architecture. Like the Kuraloviyam, in which Kalaignar wrote about Thirukkural, through the construction of Valluvar Kottam he gave an architectural presence to Thiruvalluvar, in Chennai. 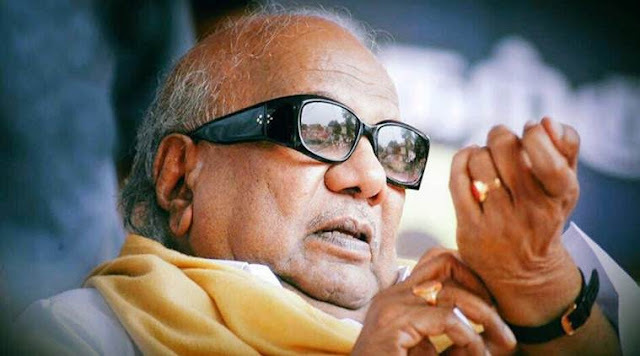 The books written by Karunanidhi include Sanga Thamizh, Thirukkural Urai, Ponnar Sankar, Romapuri Pandian, Thenpandi Singam, Vellikizhamai, Nenjukku Needhi, Iniyavai Irubathu and Kuraloviam. His books of prose and poetry number more than 100.